Cities around the world are adapting to electric scooters as an alternative to cars. Lime, a California-based bicycle sharing company has a fleet of dock-free electric scooters in Paris, as part of a wider roll-out in several European cities, Reuters reports. "Paris is our first big-scale deployment in Europe, we have big ambitions in Europe," Lime France director Arthur-Louis Jacquier told Reuters. Lime is putting a few hundred scooters on Paris streets and hopes to expand that to a few thousand as demand grows. Lime, founded in June 2017, has raised $350 million from Silicon Valley investors and plans a next financing round for several hundred millions of dollars for its U.S. and international expansion, he added. The scooter can be left anywhere when the customer has reached their destination. Lime users can find and unlock the scooters with a mobile phone app and leave them anywhere after their ride, which will cost one euro per ride plus .15 cents per minute. Their speed is limited to 24 kilometers (15 miles) per hour and they have a range of 50 kilometers. All scooters will be picked up every night around 9 p.m. for recharging and repairs. "Gobee was a good learning experience. Lime is very different. By picking up the scooters every night we will avoid problems with breakage," he said. 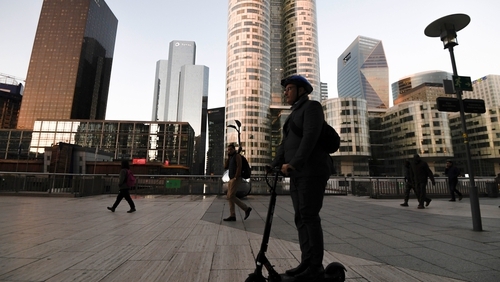 In recent years, Paris has been a test bed for new mobility solutions, with several Chinese bike share operators and two electric motorbike schemes launching services in the French capital. In Ireland and elsewhere It is illegal to ride powered scooters on public roads or footpaths, but another company trying out the scooters in London's Olympic Park is hoping to get the law changed within 12 months. Bird, which operates in around 40 American cities, believes that its pilot scheme - on private land - will demonstrate the usefulness of this hop on, hop off form of transport and its environmental benefits. The scooters are unlocked with an app and are only be available between 07:00 and 21:00. They will then be collected and charged overnight, this avoiding problems with theft and vandalism, according to a BBC report. Bird's UK and Nordics chief, Richard Corbett, told the BBC that in Paris and Amsterdam, where it is already operating, the scooters have "quickly found a place in the urban transport mix and shown they can be safe". With its relatively small city space, it would seem Dublin might be a logical next step for these companies but getting the law changed may be quite the biggest challenge. However, if the idea did take off imagine the difference it would make to city streets - currently clogged with one-person cars on a daily commute involving less than 20 km ?